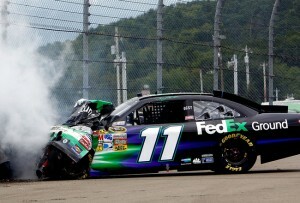 A promising start to Monday’s rain-postponed NASCAR Sprint Cup Series race at Watkins Glen (N.Y.) International turned scary on Lap 66, as Denny Hamlin walked away from a head-on collision into the retaining wall outside the first turn. Hamlin started 42nd in the #11 FedEx Ground Toyota after a qualifying spin on Saturday, but a fast race car and perfect fuel strategy put him on the cusp of the top-10 for the final third of the 92-lap event, won by Marcos Ambrose. Good on gas for the remainder of the event, Hamlin was primed for a top-five result. 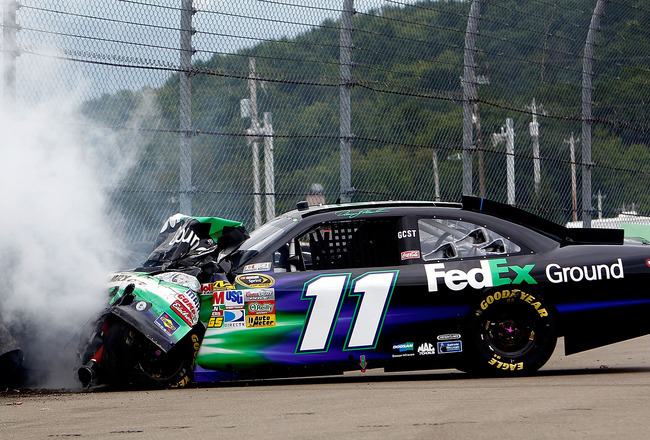 However, an issue on the #11 machine heading down the front straightaway prohibited Hamlin’s ability to slow down for the first turn, resulting in a spectacular shunt into the tire barrier. Hamlin was transported to the infield care center, examined and released. The finish dropped Hamlin one spot to 12th in the NASCAR point standings following Watkins Glen, 126 points behind leader — and Joe Gibbs Racing teammate — Kyle Busch. He still holds the second of two Chase “wild card” spots with four regular season races remaining. NASCAR returns to action at Michigan International Speedway, August 21.